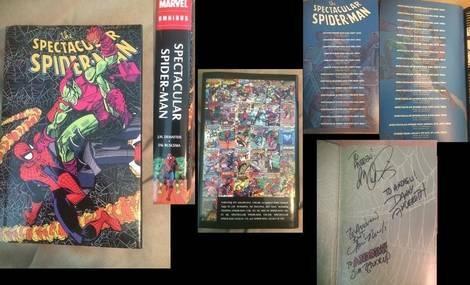 Petition Proposed JM DeMatteis & Sal Buscema Spider-Man bind - fan created, creator approved! Please read, sign, share & support! Proposed JM DeMatteis & Sal Buscema Spider-Man bind - fan created, creator approved! Please read, sign, share & support! One of the greatest Spider-Man stories has never been collected and released by Marvel. Fans want this bind released, creators approve of this bind, and we’re hoping YOU want this released, but we need YOUR HELP! HISTORY – How this project originated. Last year I bound one of my favorite runs – JM DeMatteis & Sal Buscema’s Spectacular Spider-Man run, focusing on the tragedy of Harry Osborn. The undertaking was a labor of love. I propose that the run be collected officially! JM DeMatteis’ Spectacular Spider-Man needs to collect in omnibus format. The collection had one of the best character studies and arcs in memory – dealing with the struggle of Harry Osborn. The story dealt with family generational legacies, friendships, mental illness, and grudges. The story has stuck with me 20+ years after being released, leading me to get my collection custom bound. Since receiving my collection there are certain alterations I would make prior to a wide release. Prior to One More Day, Marvel released a truncated TPB, Spider-Man – The Son of the Goblin (0785115633). Material from that trade, such as the summaries, would be utilized an omnibus. “Spider-Man: Curse of the Green Goblin,” actually begins before JM DeMatteis’ run, and would include additional material for summation. SUMMARY INSERT – use the PREVIOUSLY insert, summarizing Harry Osborn’s struggle, that was included in Son of the Goblin TBP. SUMMARY INSERT – Include a new summary page, “but the past was not finished with Harry Osborn and shadows from his father’s legacy continued to creep into his life! Amoral billionaire fashion designer Roderick Kingsley becomes obsessed with Norman Osborn, the original Green Goblin, after discovering locations of his various hideouts and became the Hobgoblin! Wanting more of the Green Goblin’s secrets, Hobgoblin sought out Harry. Harry protected his family and drove off Hobgoblin on more than one occasion. Yet the Green Goblin in the back of his mind.” insert material from Amazing Spider-Man 259-261. Panels would be mixed in with summary text, much like the SotG trade summary. Amazing Spider-Man 312 by Michelinie & McFarlane. Web of Spider-Man 66-68 by Conway & Saviuk. SUMMARY INSERT – Include a new summary page, “When Hell on Earth literally broke out in New York, Harry felt his own demons come back to the surface.” Gerry Conway addressed Harry in various issues of Spectacular Spider-Man, namely during Inferno. These moments are single panels, not full issues. These panels would be mixed in with summary text, much like the SotG trade summary. INSERT – BLACK PAGE. Harry Osborn dies on the last page of Spectacular Spider-Man 200. Include a black, blank page allowing the reader for a moment to digest. SUMMARY INSERT – “Although Harry and Peter reconciled. But the Green Goblin is a poweful beast, and Harry, in his madness set events in motion, that would reach out beyond the grave.” Include summary of Peter’s parents return and ultimate revelation of Harry’s plan. Include shocker ending from Amazing #365, a few panels of Peter & the pair interacting, revelation Peter’s parents are robots from Amazing #388, include a few panels of Pursuit, ending with Spider-Man 389’s last few pages, with the Harry Osborn, GOTCHA, reveal. Spectacular-Spiderman Annual #14 By DeMatteis, Nocenti & Buscema. Spider-Man: Legacy of Evil, written by Kurt Busiek & Texiera. The story has not been fully collected before, and with good reason – the story spans decades. Creators left breadcrumbs which DeMatteis & Buscema further developed during their run. Conway first touched upon the Goblin legacy in 136 & 137, which we believe should be included in full. Harry’s shrink became the Green Goblin for a short story arc – Amazing Spider-Man 176-180. I am on the fence is this should be collected. In this volume. While its inclusion illustrates outside forces coming back to Harry, I believe its inclusion would be side-stepping Harry’s larger story. If this story doesn’t deter from the larger arch, I would recommend its inclusion in an abbreviated form. The emergence of the Hobgoblin shifted the legacy away from the Osborns till issues 260-263, which could easily be collected via summary. Amazing Spider-Man 312 should be included in full as it directly deals with the summary prior, and sets the stage for Harry trying to use the Green Goblin as a means to defend his family. Harry dies in Spectacular Spider-Man 200. When DeMatteis went over to Amazing Spider-Man he resolved the then current Parent’s storyline with Harry as the mastermind. We believe its important to include this story in a summary as this shows the legacy of hate goes on beyond the grave and sets up the two epilogue stories. Omnibus is designed in classic Marvel Omnibus format. END PAPERS - Something Green. TABLE OF CONTENTS – List each issue in the collection, IE Amazing Spider-Man #, writer & artist name, then release date. Text is set against Amazing Spider-Man 136 and Spectacular Spider-Man 183 as background images. Back Cover – Includes images of individual comic covers contained. Gerry Conway has given his approval for the release of this collected edition. Conway laid the ground work, planting the seeds for future stories. He gave his approval via Twitter. Getting marvel to print an omnibus is not an exact science. The key component is word-of-mouth, specifically not letting word of mouth die. We cannot do this alone and we need YOUR help! a. For the price of a stamp, let Marvel know, you want this collection! a. If you enjoyed this run, post this petition on boards you frequent, casting a wider net will help us get support. c. Share as much as you can. a. You can email Marvel, but we recommend the first two listed methods.